Do you feel like your 30-inch monitor just isn't big enough? 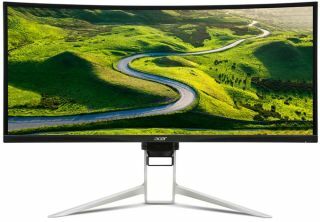 Acer gets you and it's responded with the XR382CQK, an expansive 37.5-inch ultrawide monitor that is now available to purchase in the U.S.
Pricing has been set to $1,300 and that doesn't include a neck brace. What it does come with is a QHD (3840x1600) resolution at up to 75Hz with a 21:9 aspect ratio, a 2300R curvature, and a ZeroFrame design (Acer's fancy way of saying it has a thin, not non-existent, bezel). Note that those are Acer's official specs, but math tells us the actual aspect ratio is 21.5:10, which is better in many respects. This massive monitor uses an In-Plane Switching (IPS) panel that covers 100 percent of the sRGB color space. It has a rated brightness of 300 nits, which is decent (not stellar), along with a 100,000,000:1 dynamic contrast ratio and 5ms response time. More importantly, it support FreeSync for smoother gaming. Notably missing from the features however is support for HDR. Another bonus for gamers is something that Acer calls GameView. What it does is let gamers toggle between three customizable display profiles to tweak in-game settings without having to fuss with the OSD menu. Acer says that one of the setting capabilities is the ability to adjust black levels for better vision in dark scenes. The stand offers some ergonomic adjustments. Users can tilt the display from -5 to 35 degrees, swivel it from -30 to 30 degrees, and adjust the height up to 5.11 inches. There is a built-in USB 3.0 hub with four ports, along with a USB 3.1 Type-C port, albeit Gen 1. Other connectivity options include HDMI 2.0 and DisplayPort 1.2. Finally, the XR382CQK has has two 7W speakers with DTS Sound. We've yet to be really blown away by a monitor's built-in speakers, though 7W isn't too shabby. Still, we don't recommend ditching your speakers or headphones. The XR382CQK is available to order now. Acer made a mistake in its press release regarding the XR382CQK's resolution. The correct resolution is 3840x1600, not 3440x1600 as originally reported.